Got Friends? Refer in November! Drivers, Keep Active in November! Get your November Daily Active Bonus! Complete at least 1 ride daily for 20 days in November in order to qualify for the Daily Active Bonus. 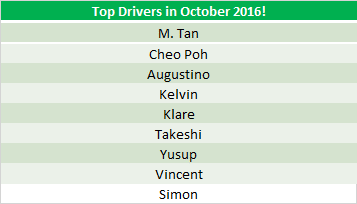 Congratulations to our top 60 Drivers for the month of October! All winners will be contacted and rewarded accordingly. And here are the top 10 Hitch drivers! Each of them will receive an additional reward of $100 in CASH! And you could be one of them too! We’re not done! 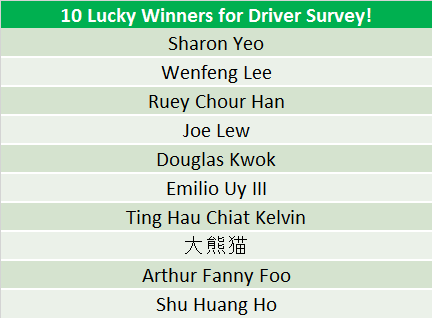 Here’s another round of congratulations to these 10 lucky drivers who have each won a pair of GV movie vouchers for participating! We really appreciate everyone’s feedback and we promise to use your input to improve the GrabHitch experience. Stay tuned! Based on the sheer number of referrals we received in October, we’ve decided to extend our DRD scheme to November as well! Like before, all Hitch drivers will get $20 for every friend they refer after that friend does 1 ride, and that same friend will receive $20 after he/she completes that 1 ride as a driver. THERE’S MORE! We are introducing a BONUS tier for all drivers who refer more than 3 or 5 friends this month – check out our DRD page for more details.